Luxord is described by Jiminy Cricket as "a master of rhetoric". He was first introduced in Kingdom Hearts II and is also known as the "Gambler of Fate". 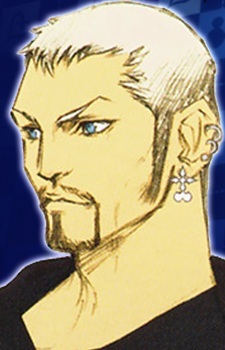 Luxord is voiced by Robin Atkin Downes with an English accent in the English version of Kingdom Hearts II and by Jouji Nakata in the Japanese version. His lesser Nobodies are Gambler Nobodies. With games of luck, Luxord is able to transform Sora into a card or a die, and uses a deck of cards as weapons, defense or hiding places. Luxord also has power over time. Luxord appears in Kingdom Hearts II at Port Royal from Pirates of the Caribbean: The Curse of the Black Pearl, where he revives the curse of the Aztec gold, and the cursed pirates along with it. Luxord makes use of the opportunity to scout the powerful Grim Reaper Heartless and the gold's curse to ascertain as to whether or not they would be useful to the Organization in terms of Sora's part in their plan and making Port Royal's people assist in it as Heartless. For amusement, he has his Nobodies steal four of the Aztec medallions while having Grim Reaper curse Jack Sparrow. Sora defeats Grim Reaper in order to free Jack from his curse and Luxord collects the forthcoming heart before escaping without fighting Sora and his party himself. At the World That Never Was, Luxord traps Sora's companions in his cards, leaving Sora to fight alone in a battle. Luxord fades back into darkness, unable to comprehend how "Roxas" could kill him.